(APN) ATLANTA — On March 05, 2015, Ringling Bros. and Barnum & Bailey Circus, through Feld Entertainment, Inc., its parent company, announced they would end the practice of using Asian elephants in their traveling circus performances by 2018 a victory for animal rights advocates everywhere. The move comes after years of criticism from animal rights activists of the circus’ treatment of its elephants. Councilmembers Felicia Moore (District 9) and Joyce Sheperd (District 12) championed the cause of banning the bullhook in the Atlanta City Council. The Council declined to ban the bullhook outright, although Moore, Sheperd, and Natalyn Archibong (District 5) voted in favor of the ban. The Council did pass legislation that more vaguely banned elephant abuse. Meanwhile, then-Commissioner Robb Pitts (District 2) pushed through legislation to ban the bullhook in Fulton County. The bullhook, a bronze or steel hooked rod that is inserted into the elephant’s sensitive skin, either slightly or more deeply, to cause pain and induce the elephant to behave in a certain manner. “I am beyond excited at the news that Ringling Brothers will phase out elephant acts by 2018,” Moore said in a statement. People for the Ethical Treatment of Animals and Georgia Animal Rights and Protection were among the organizations active in lobbying for local legislation. 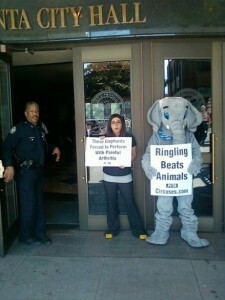 In one 2011 protest, three pro-elephant activists were arrested for blocking the entrances to City Hall. Feld Entertainment President Kenneth Feld told the Associated Press that the company’s decision was also based on the fact that certain cities and counties have passed “anti-circus” and “anti-elephant” ordinances. The company’s three shows visit 115 cities throughout the year, and Feld said it’s expensive to fight legislation in each jurisdiction. It is also difficult to plan tours amid constantly changing regulations, he told the Associated Press. Under the plan, thirteen of its elephants currently traveling with the three Ringling Bros. circus units will be relocated to the Ringling Bros. Center for Elephant Conservation in Florida. There they will join the rest of the Ringling Bros. herd of more than 40 elephants. The Ringling Bros. Circus’s last performance in Atlanta was in February 2015. “As the circus evolves, we can maintain our focus on elephant conservation while allowing our business to continue to meet shifting consumer preferences,” Nicole Feld and Alana Feld, Ringling Bros. producers and Executive Vice Presidents with Feld Entertainment, said in a statement. UPDATE 1: This article has been updated to add that Natalyn Archibong supported banning the bullhook.